Yes, I confess it takes my studio desk getting this messy for me to finally stop, clean and start messing it up all over again. It really isn't my fault....in the middle of finishing up some orders I got the bug to play with some vinyl that has been in the closet for a year. One thing led to another and this is the mess that was left at the end of the day. It will be cleaned up tomorrow after art class so I can finish the last of my ornament order - I can only work in that kind of mess for a while. Besides I can't continue with the vinyl until my order arrives....I just had to have some gold and silver, black was fine, but I need some color. Below is an Exploding Box card I worked on before the mess ensued ...I have confessed on this one to getting carried away with the bling and glitter, but I love it. There are a few more sheets of this delish striped foil paper left in my stash and I think I am going to have to make another of these lovelies. Most of this was created on my Silhouette Cameo - Joy is a die cut and the snowflakes are some embellishments in my large stash of Christmas stuff. The foil paper looked great on the outside but I felt that it needed some protection so I embossed some acetate with my snowflake EF and layered in over the striped paper - I was very pleased with the effect. The red glittery paper is light and beautiful and I am kicking myself for not buying a second pad of it when it was on sale and available last season, oh well......It is lovely. 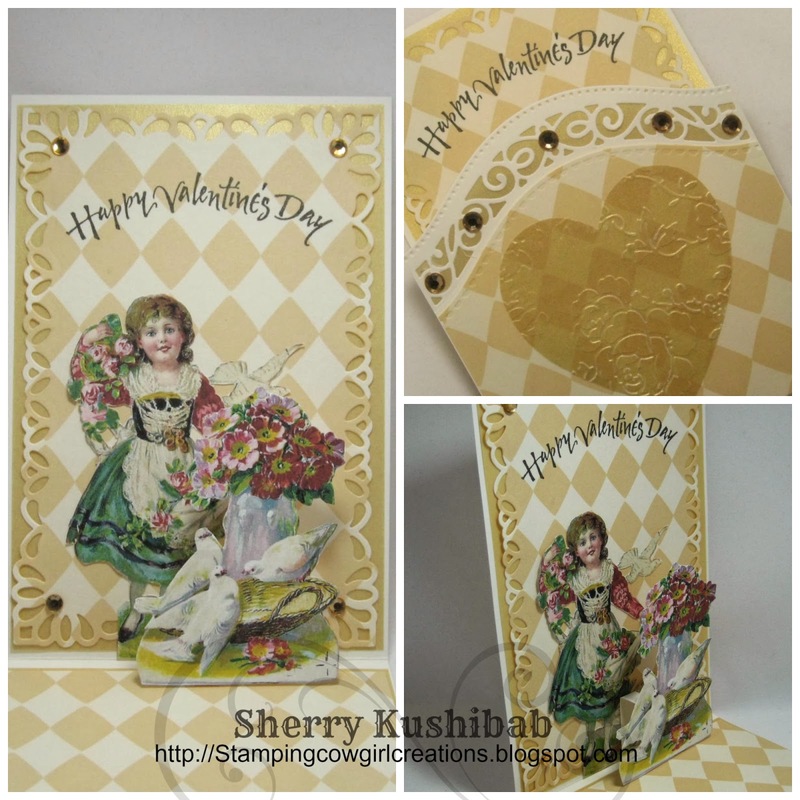 Yes, another Exploding Box card - I love making these!!! Some people walk through the craft store looking for paper - I walk through the craft stores and my head explodes with ideas for these boxes. I know some people born on Halloween and thought this would be a fun card idea. The skull is actually sitting on a spring type topper - LOL - I got the spring from a Christmas decoration I picked up for another exploding box card that I took apart to use the pieces and the spring was left over - can we say re-purpose!!! Waste not want not. 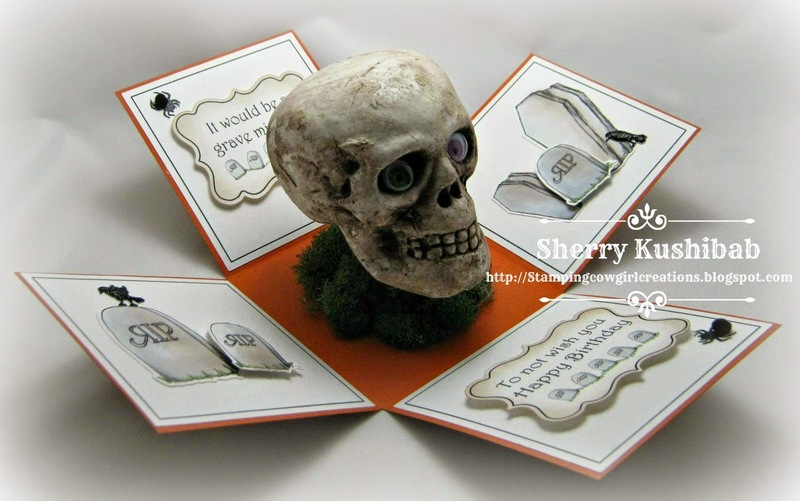 The headstone and coffin are digital stamps from Tiddly Inks - she has the most adorable images. These were intended to be used with her cute little witch, but they worked perfectly here. I couldn't help myself with the lid - the hand looking like bones was the perfect topper. This one is going in my Etsy Shop - already working on a Christmas one, then I need to stock a few more cakes - it is such fun to be busy creating. The sentiment in the card reads (starting on the top panel) "It would be a grave mistake - not not wish you Happy Birthday"
Thanks for stopping by to look. 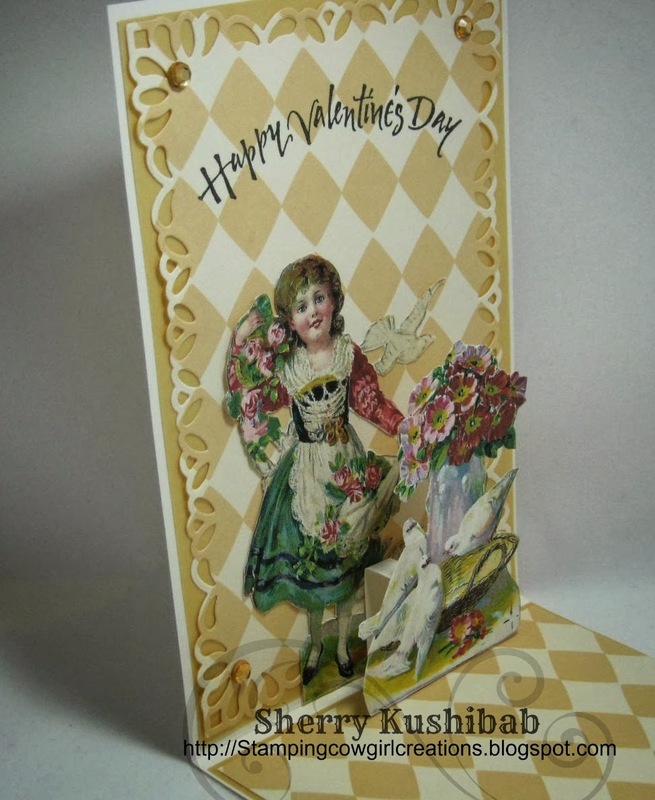 Of course it goes without saying that I used my Silhouette Cameo to produce many of the pieces for this, including the sentiments with the digital stamps on them. Materials: Silhouette Cameo, card stock, embellishments from Michaels, Googly eyes, Tiddly Ink Digital Stamps, Copic Markers, Recollections embellishments. It is pretty obvious from many of my posts that I like doing Exploding Box cards - I especially enjoy trying different themes, and styles. For some time now I have toyed with the idea of making one that could be used for a guy. Last year when I gave my hairdresser a set of note cards she was thrilled....so thrilled that she asked if I could do more work for her and we would barter. 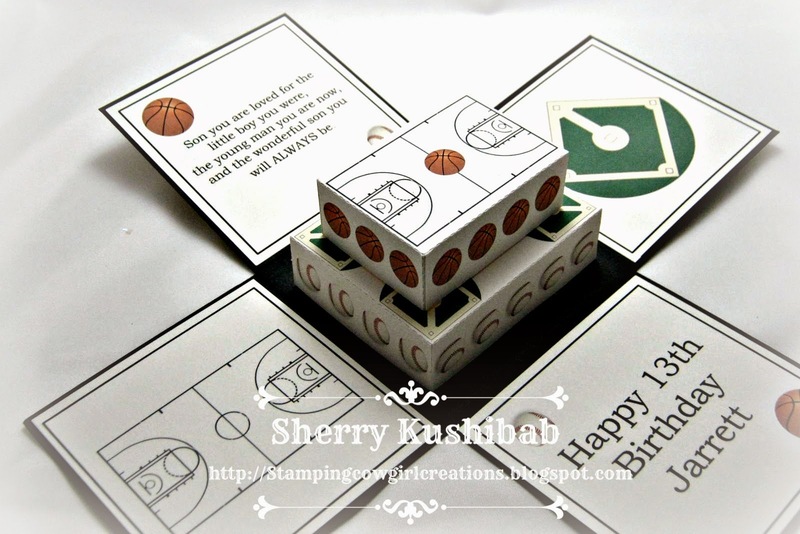 Her son's 13th Birthday is at the end of the month and she wanted an Exploding Box card for him, just my opportunity to play. He enjoys sports AND his family collects antiques of all sorts. 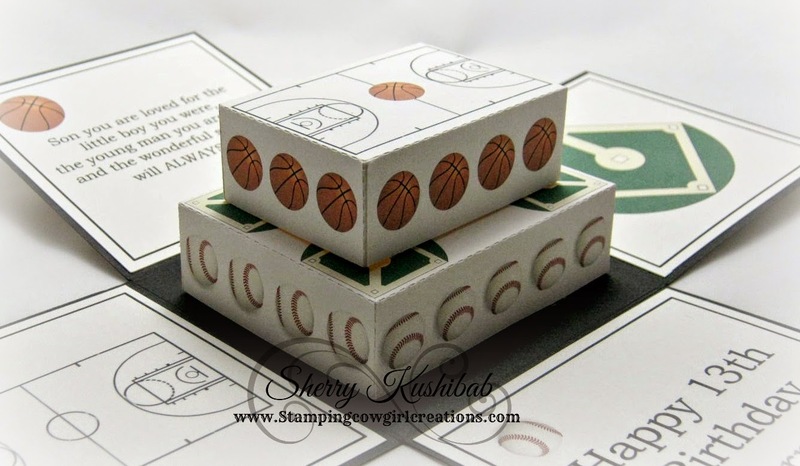 When I saw this Graphic 45 'Good Ol Sport' 6 x 6 paper at Impressive Ideas (my fave stamp and paper shop in Roswell, GA) I just had to have it. My usual cake is a round cake that I designed with dripping frosting down the side. I didn't think that was manly looking so I created a square cake. So many square cakes you see have ribbon around the outside - those were my inspiration, I just took it a little further and designed a two layer cake with designs from two of his favorite sports. Again, I didn't want to get toooo many details since this is a guy card, so I kept the lines simple. 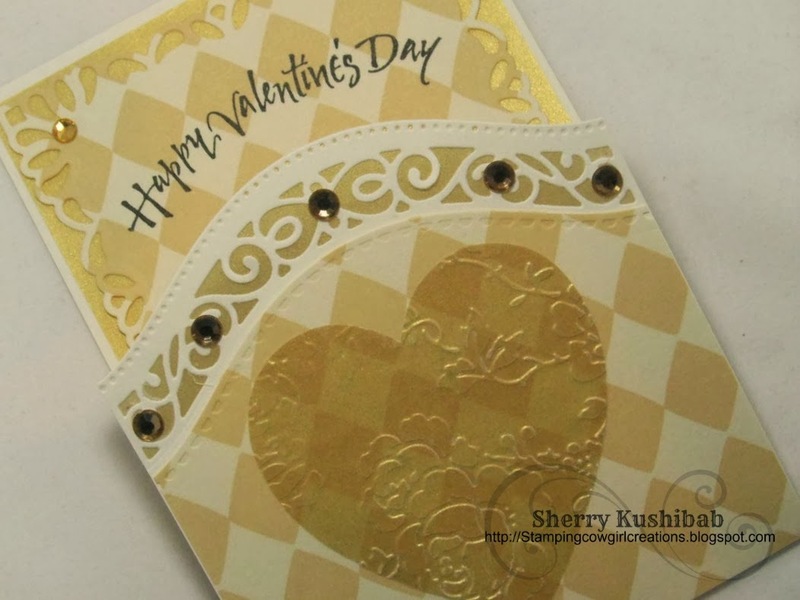 As usual I used my handy dandy Silhouette Cameo to create and cut the entire card and panels. This means I have saved the files and can make another of these whenever I want, and I want to do that soon. I get my hair done tomorrow and will be delivering this with some other things she requested, and a small surprise. Most of the other items were done using my Silhouette as well - best money I ever spent on a machine. 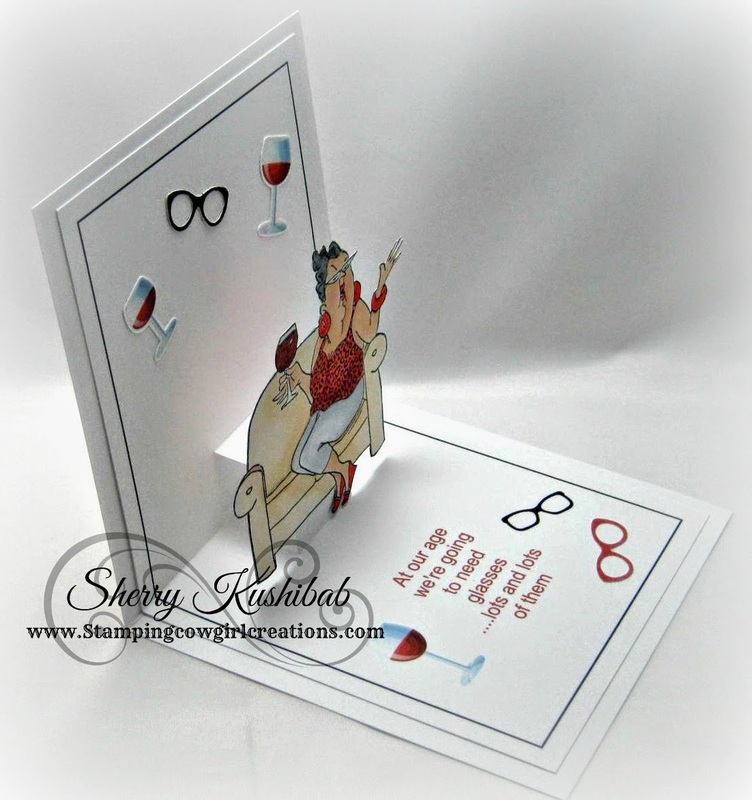 Recently made my boss an Anniversary card for her husband.....it was such fun making it that I thought I would add one to my Etsy shop. 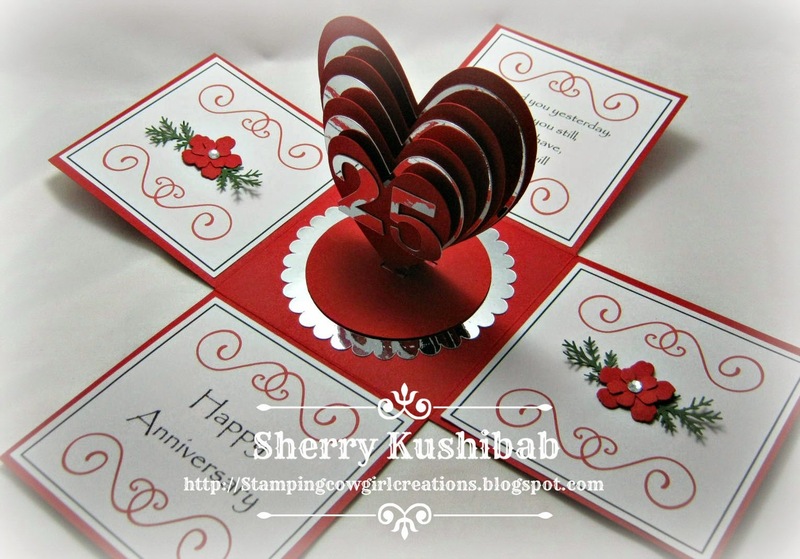 This particular one is for a 25th Anniversary - I love that I can personalize this style any way that someone may want. I loved using my Silhouette Cameo to make this, literally everything except the flowers was print/cut with my Cameo - its a great machine that I am pretty sure can do even more if I could find a way to spend more time working with it. Maybe now that I am partially retired I will get to play more. I will probably make some more of these for Valentines day.......already have one started for Halloween, its going to be spooktacular, bwahahahaha! Had lunch with a friend yesterday and we stopped by my fave stamp store afterwards Impressive Ideas in Roswell Georgia. They were unpacking a new shipment of pull out pop up stationary and I just had to have some. Ideas for this card are just exploding in my head right now so it was difficult to sit and decide just exactly what I wanted to do first. I used my Silhouette Cameo to cut the border and then grabbed a Mo Manning image I had laying in my work area - I didn't want to over think the card so I went with what was within reach. 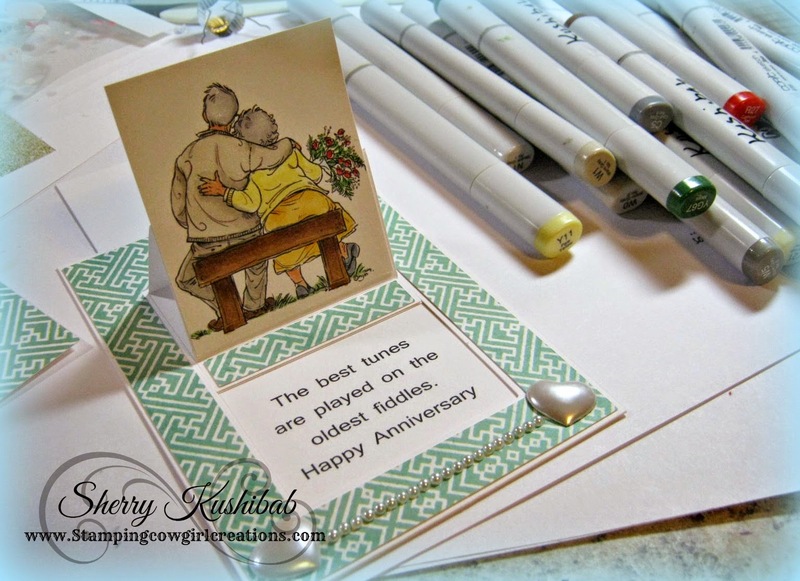 After coloring this sweet old couple with my Copic markers (you can see just a few of the markers laying next to the card that went into coloring this image). I used my Silhouette to create a sentiment. The overall look of this card is pretty clean an simple, at least for me, You will certainly see more being created in the near future. Needed a card for my shop and a friends birthday - once I started coloring and cutting it only made sense to make two cards. Once again I have used Celeste from Art Impression and some clip art to embellish around her. 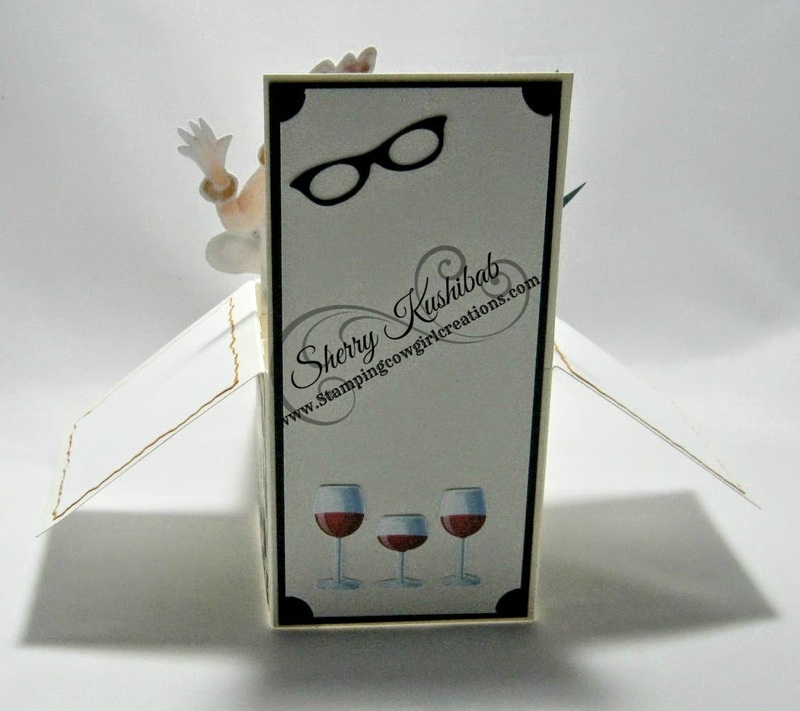 This is a pop up card, the inner layer for the pop up was created on my Silhouette Cameo. Using the Cameo allowed me to put the black border around the inside layer as well as be sure my cuts were straight. I also chose to type out the sentiment from AI to be able to size it to my liking. Celeste was fussy cut by me after I colored her with my Copic markers. I had originally thought I would make her hot pink, but thought red suited the card more. 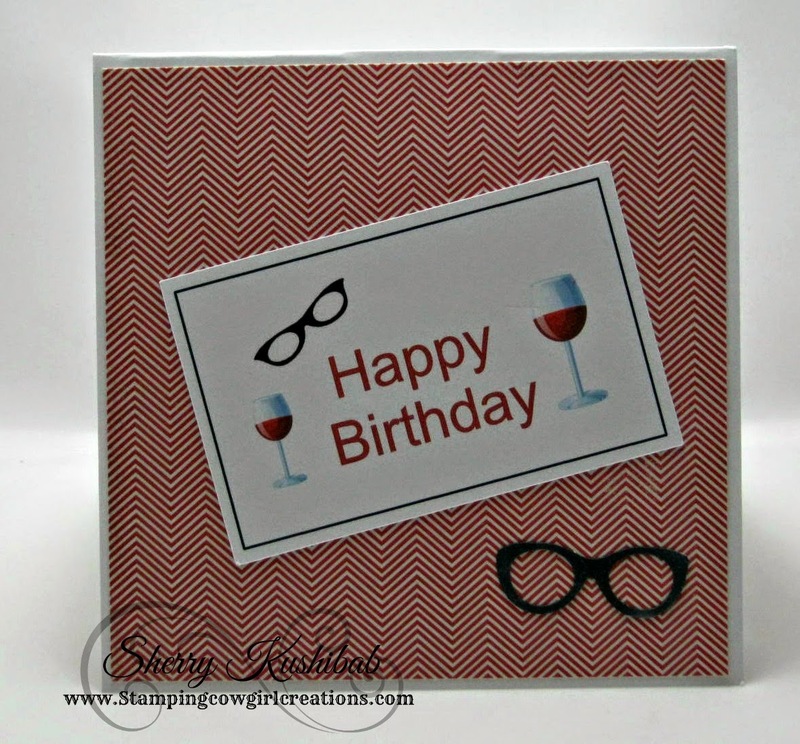 Once again I added not only wine glasses but frames for eye glasses. My girlfriend is always digging for hers when we go to lunch and this will be perfect for her. The front is fairly simple allowing the inside to be the surprise. While my friend loves my Explosion Box cards she is a year shy of a milestone birthday next year so I am waiting to make her one for that birthday. I was out to lunch with a friend recently and we ended up being walking distance from my favorite stamp store in Roswell Georgia Impressive Ideas. I couldn't be that close and not run in to look/shop. 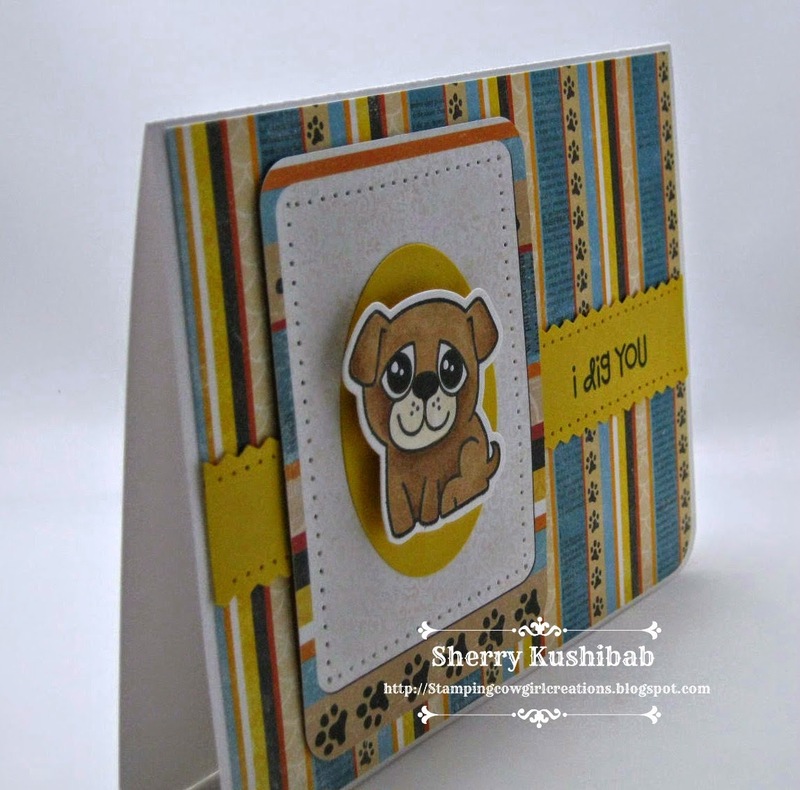 These Puppies by Paper Smooches caught my eye immediately! 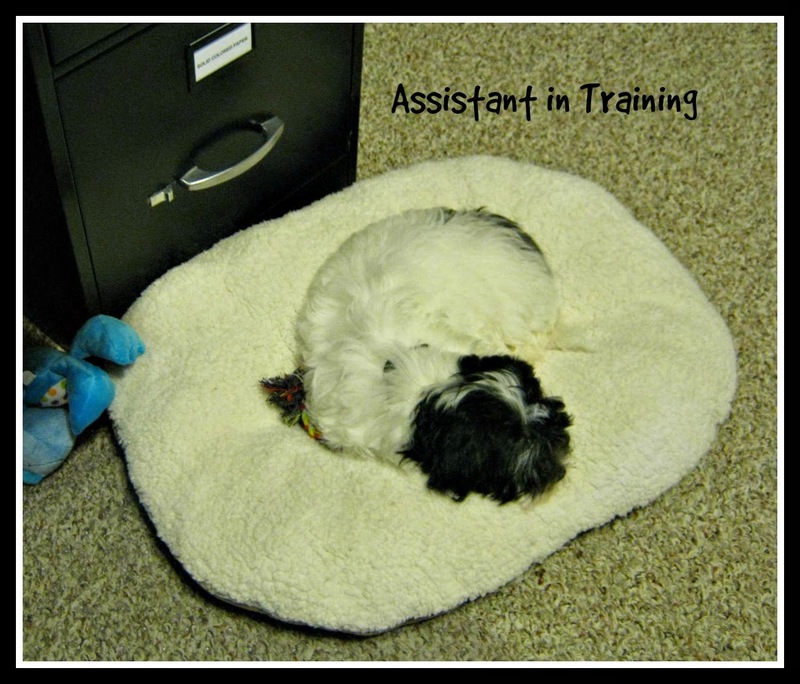 Not only are they adorable, but three short weeks ago we brought home a new little furry addition to our family and I have to admit to having had 'puppy on my mind' when I saw these. 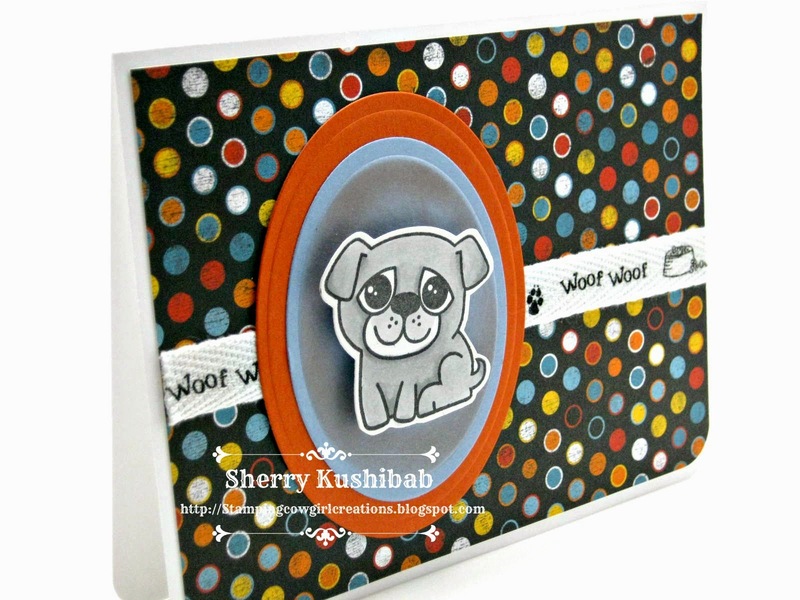 Those big ole eyes were just calling to me - and how could I resist the perfectly matching paper by Bo Bunny in the Happy Tails Collection. These were meant to be together. With my newest assistant Riley at my feet I took advantage of his napping and inked up this new set. This little fella below just calls out "Thinking of You" with those big old eyes and his sweet markings. 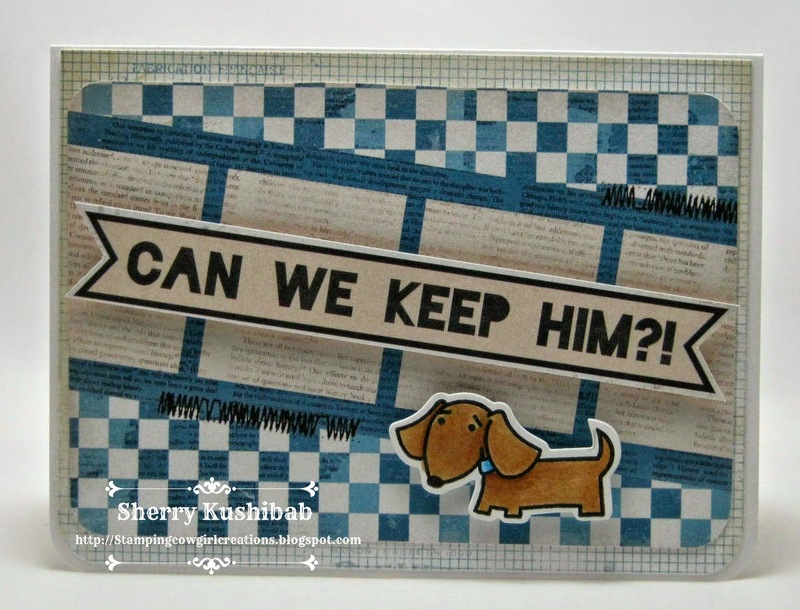 This paper was perfect, the sentiment is the top half of another sheet that I cut out and popped up to lay across the sheet....and that sweet little wiener dog looks ready to go home with someone. This is a sentiment I can really relate to as I must have asked my husband this question at least a 1,000 times before he gave in. I loved the bright prints of this 6 x 6 sheet - I added a few piercing details to the frame paper and the yellow piece across the middle. The inside sentiment of two of the cards sums up true doggie love - I haven't even made a dent in the 6 x 6 pack of paper......and there are a few more stamps that need inking up..... but hey tomorrow is another day. Glasses, glasses - where are my glasses. 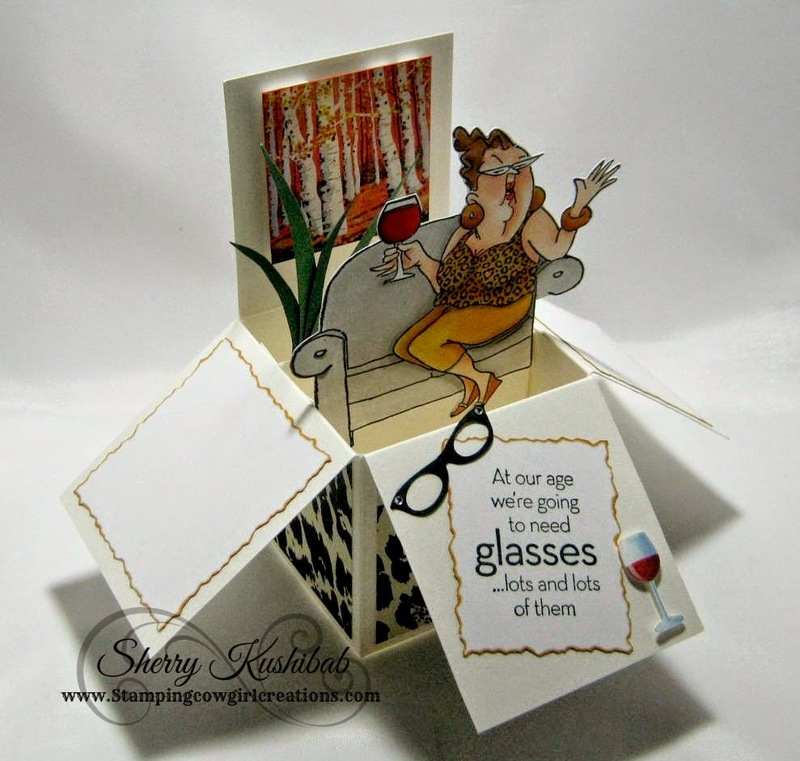 Recently I took some time to create a pop up box card, not to be confused with my Explosion Box cards, this style of pop up card has become quite popular after a tutorial on Splitcoast Stampers HERE. While I love the ones using flowers, and I am sure to make some like that, this particular day I was driven to use an AI stamp I purchased last fall that has never been inked up. These cards are nice and you can put a lot of layers together, but proportion is key, in my opinion. I just couldn't see how this stamp would work but I was determined to try. Playing around I discovered that if I cut part of the couch arm out this sassy little lady fit wonderfully. 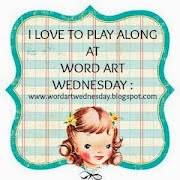 It became obvious to me as I played with this and the sentiment that came with her that I needed to make this card for Jill Saur, my art instructor, she is always switching her glasses to look at various pieces that students are working on. To make the card even more personal I went to her website and copied a piece of her artwork (scaled way down) to use in the background. She paints stunning scenes with birch trees, as well as many other lovely pieces. Since she shares her talent for art and teaching with me I wanted to share some of my card making talent with her - I think she enjoyed her card. Yes, you read correctly I am taking art classes. I am at the age that one realizes they are getting older.....don't get me wrong I still adhere to that old adage 'growing up is inevitable, growing up is optional'. 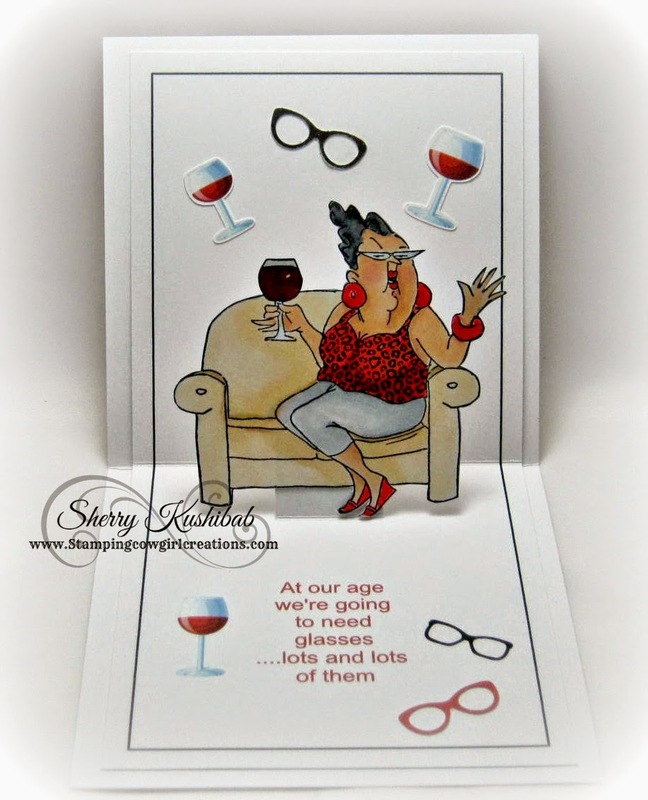 However, this year is a milestone birthday for me...as I will be turning 60. No matter what they say 60 isn't really the new 50 - it is 60!!! Needless to say I have been pondering this event since my last birthday, reflecting so to speak......where have the years gone, how do I feel about things I have accomplished or not accomplished.....and what do I want to do as I grow up. There is no bucket list, but there are some things that I have always thought might be fun to try or learn and I recently gave myself permission to try one of those things - the aforementioned art class. After thinking about it for more than a year I got in touch with a local Artist/Teacher Jill Saur in my area and was able to find a place in one of her classes. This week was my fourth class and I am so happy with my decision to take this risk and develop this new skill. There are some lovely people in class......I have enjoyed the other students and Jill. The two and half hours fly by each week. Yep, there is a little coloring and cutting going on in the stamp room today. I'm in need of some more Easter cards. 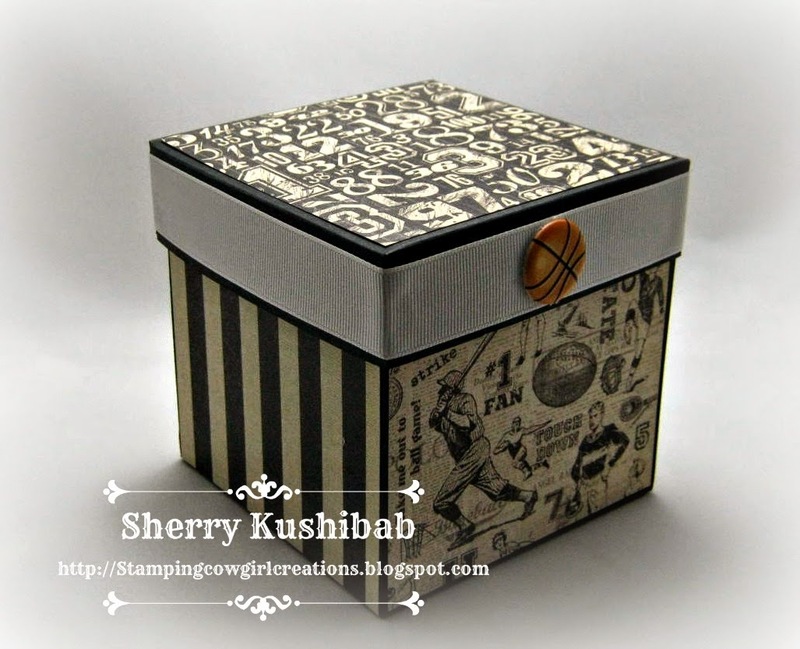 My go to stamp is from Flourishes, who sadly is no longer in business. This cross with Easter Lily's was designed by Marcella Hawley - You may not be aware of this but she has opened her own on line stamp shop this week called Power Poppy (please check it out she has put together an outstanding design team) If her new designs are anything like this one I am gonna be one thrilled stamper. Two of these beauties above will be going into my Easter Exploding Boxes that I sell and make for friends.....and some will be going in a pop up style card I have designed. I usually cut out the center flower from a second stamping and after a little bending and folding layer it over the one on the cross for some dimension. 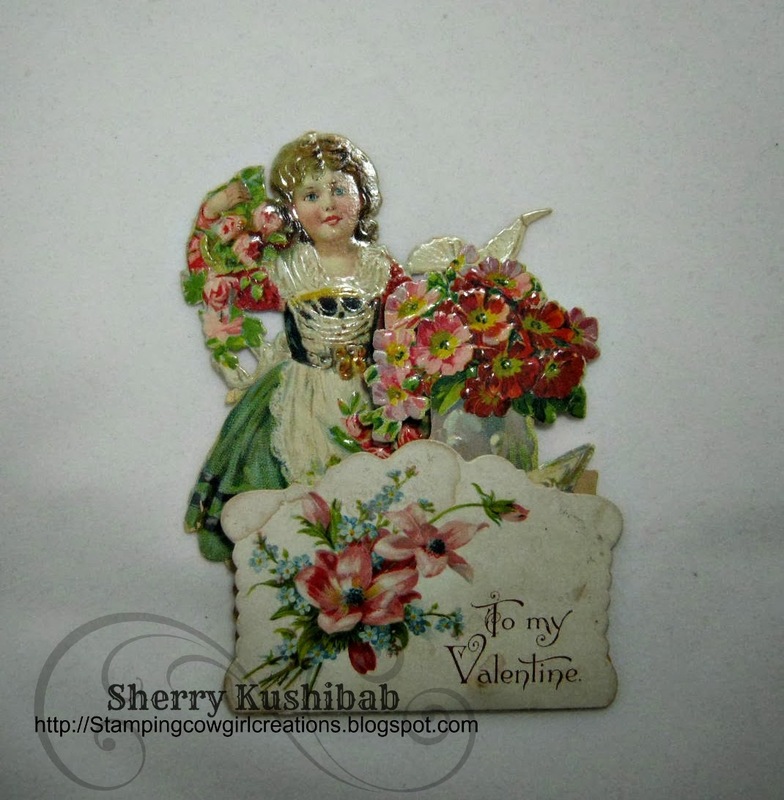 I will also be digging out a rock stamp I have to layer in the pop up card as well. I would have taken a picture showing more but then you would know what a mess I create when I am coloring and cutting. The last week and today has found me working on several Easter cards.....this little chick is a stamp I purchased last year. My first thought was to stamp it, color it, layer it on a die and put some bright busy paper in the background......but I instead decided on a more clean and simple look (If you know me then you know that clean and simple does not usually describe my style at all). 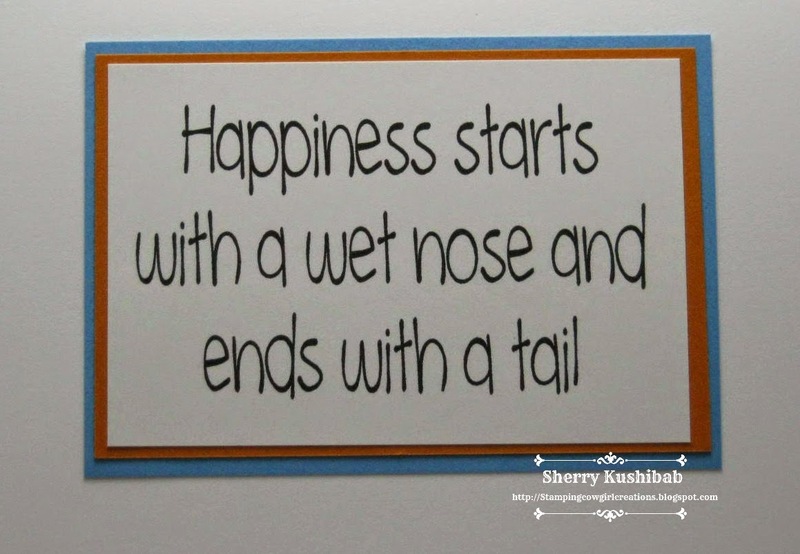 Using my Silhouette Studios text feature I typed the word happy and merged it with a rectangle. The word Easter was typed and the cut feature turned off to print the word instead. I also did an internal offset to create a golden yellow line around my word and shape to coordinate with the background paper I decided to use. After printing and cutting I stamped my little chick next to the word Easter and with my Copic markers colored him in. I like the yellow polka dot paper and how it coordinates with the little chick....definitely the kind of card that brings a smile to my face when I am finished. Patting myself on the back for keeping it simple as well. If you live in the Georgia area, like me, it the perfect kind of day to finish up some special orders. With the snow, sleet and ice no one is going anywhere, we are hunkered down, staying warm, and hoping we don't lose electricity. I have finally fine tuned my cut file on my Silhouette Cameo to make my 'no calorie' explosion box cakes. The machine cuts them like butter and I assemble them easily....no need to even lick my fingers. My main reason for designing this file was to have consistency when I make these AND I wanted a certain look to the frosting on the side of the cake. Instead of my usual two layer cake I have created a single layer cake so I could add a special topper for some people getting ready to celebrate their 50th Birthdays. I need to get a few of these done. 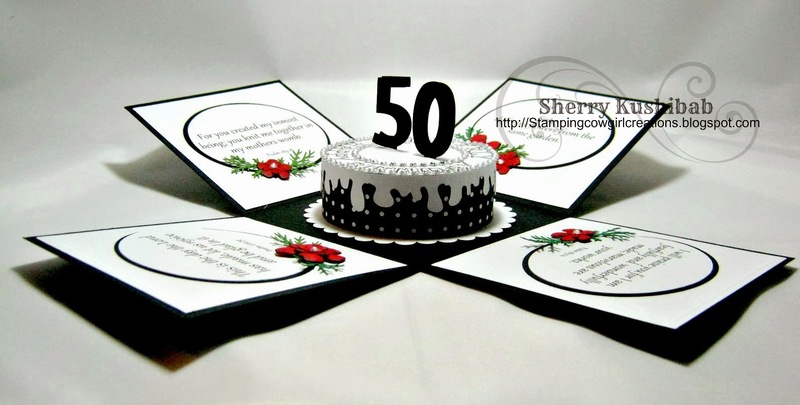 I know, I know, when someone turns 50 you are suppose to raz them and give them a hard time, but the request was for this one to be a little more special.....trust me there is one coming that has some head stones on it, as well as some cute sayings. The cake below is one I recently finished for sale at my Etsy and Zibbet shops. I have another almost finished - I really have great fun making these. 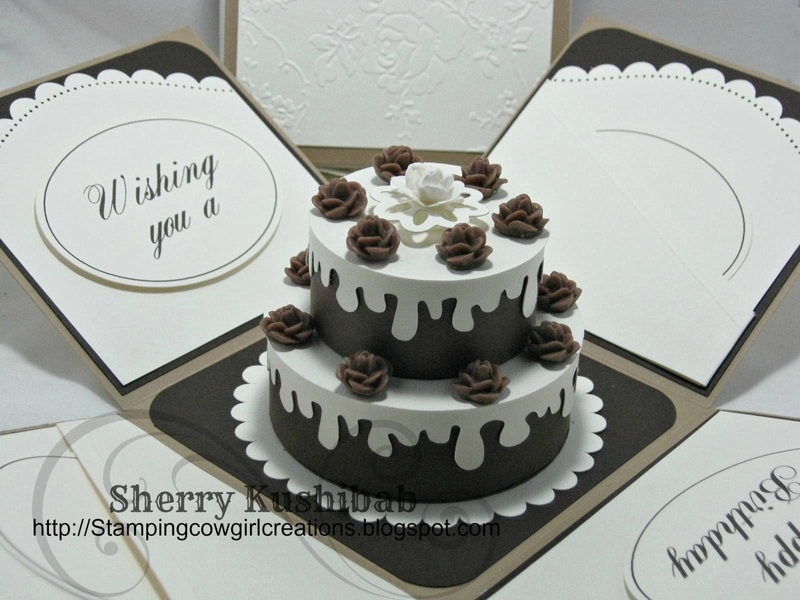 The scalloped piece below the cakes is another file I was able to design and cut on my Silhouette -perfect for the consistency I want when I make these. Off to start designing one for Easter........Thanks for stopping by. Materials: Silhouette Cameo, Card Stock, Floral embellishments, rhinestones, hand made flowers, computer, embossing folder, designer paper.